Over the last 12 months, according to people who know, my modest little Facebook page has received over 500,000 comments urging me to run for President of the United States. Clearly, the time has come to consider these invitations with a measure of seriousness. And so today, after nearly thirty seconds of careful soul-searching, I’m pleased to officially announce my decision to run for the highest office in the land. And that decision is of course, no. Naturally, I’m flattered – deeply. But aside from my conspicuous lack of experience, (I can barely keep a TV show on the air,) I’m afraid I lack the temperament for elected office. My dog on the other hand, is not only more suited for the role, he is, according to the most recent polls – more popular than his master, and therefor, far more electable. So, I would be willing – under Freddy’s leadership and guidance – to serve as his Vice President, and in that regard, your humble servant. With that in mind, I’m pleased to officially announce our candidacy, and submit to you a ticket worthy of your consideration. 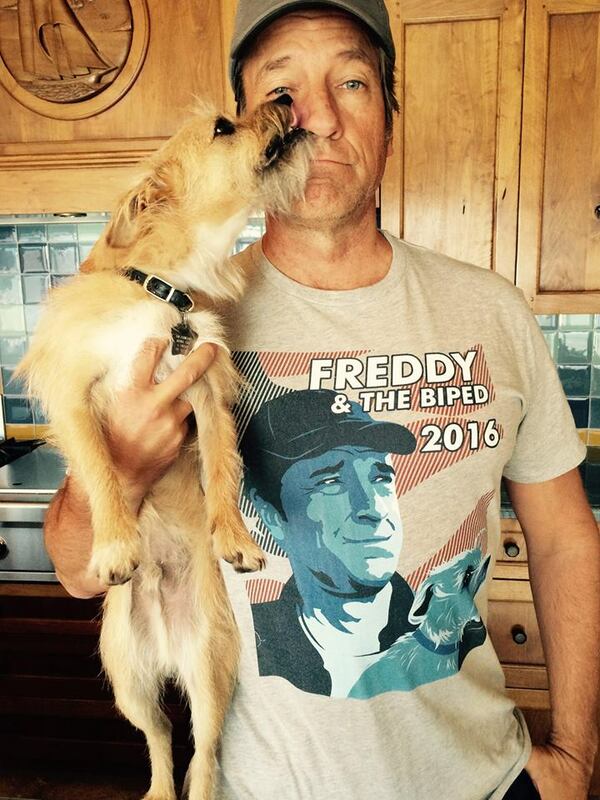 More importantly, a tee-shirt and sweatshirt worthy of your money – Freddy and The Biped, 2016. As we speak, these handsome garments are available in whatever size you need. Quantities are unlimited. However – they are ONLY available for the next two weeks. After that, they will never be seen for sale again, except perhaps on Ebay, where enterprising opportunists will no doubt sell them for astronomical sums. To be entirely transparent, I doubt we’ll win. Freddy’s platform is breathtakingly self-absorbed, and his current worldview somewhere between Trump’s and Bullworth’s. But at least I understand it, and for that reason alone, I can support it. As for the garments themselves, I think it’s safe to say that no finer collectible will ever appear on this page. And for the world-weary observer of our precarious political process, I can think of no more appropriate Christmas present. Proceeds will not benefit the campaign, but they will go a long way in bolstering the next round of mikeroweWORKS scholarships. Details are here.